Resolutions and Assorted Thoughts on Salt and Things – Eat Me. Drink Me. It could be being back in Pennsylvania, where, growing up, a special meal out was at Applebee’s and something super fancy got celebrated at the Olive Garden. I felt this strange pull to big-house chain food as my bus rolled into the WalMart parking lot on Atherton – we’d passed a Texas Roadhouse – and I thought – I want that. So for our first dinner, Liz and I went to the Texas Roadhouse, where the waitresses all stopped and line danced to Devil Went Down to Georgia and at least five tables were celebrating a birthday that got Yee-Hawd. But my pulled pork sandwich was good and the rolls, buttery and mashable and slapped with cinnamon butter, were delightful. And for breakfast this morning, we went to a small chain breakfast joint, The Original Waffle Shop, much like an Ihop or Waffle House but with less slick and sticky patches of maple syrup glazed onto the tabletops. My omelet, with feta cheese, tomatoes, and spinach, was good and the homefries were perfectly done, an ideal ratio of crunchy fried nubs and soft red-potato rounds. What is it, I wonder, that makes me disdain chain restaurants. Principle? Glossy printed menus and servers who’ll “take care of me?” Is it kitsch? Middle America? Clearly they must have figured something out to be so successful and ubiquitous in the American cultural landscape. I will also admit, I have had worse meals at some private restaurants than at chains. How do they do it? It must have something to do with the Stuff On The Walls. Or salt. And then again, food in Pennsylvania is not just chain restaurants. I always know I’ll eat well at Liz’s; her mother cooks classic Americana for dinner and there’s always something tasty lying around, like brownies or rich chocolate milk fresh from a local dairy. And things I never buy for myself (like baby carrots with Ranch dressing), because I long ago learned that cereal always tastes better at other people’s houses. This time, I woke up on Saturday morning to her parents sitting around the kitchen table measuring out 4-oz bags of chipped dried venison from an extra deer a friend had shot and killed. 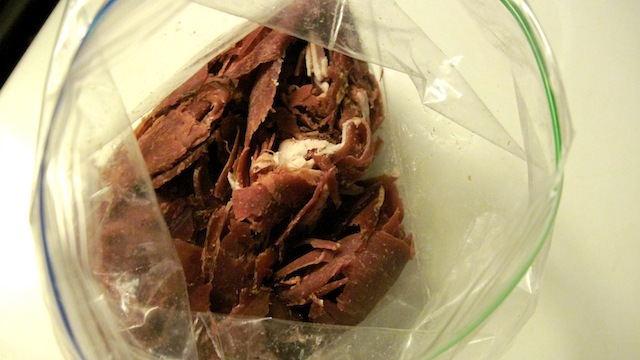 The meat is taken to an Amish farm where it’s cured and dried and for an extra two dollars, chipped into paper-thin pieces. For dinner that night we had creamed chipped venison based on a recipe from something like the 1975 edition of The Joy of Cooking. The book was worn, with cracked binding and sauce-stained pages; the hallmarks of a well-loved cookbook. I’ve been sent home with a bag of chipped dried venison for myself and a photocopied page of the recipe. I’ll make it back in New York, a reminder of a place where food is simpler and cozy, a buttress against snow and cold. As for the chains? I’ll leave them for PA, for the home journeys where we meet for Margaritas at Chili’s or find ourselves craving cheese biscuits from Red Lobster or Olive Garden’s breadsticks. Where simple food with lots of salt and butter overcomes the garish apparitions dangling from the walls. Where really, it’s less about food and more about being back home anyway. After all, I have resolved to be Relatively Nicer.